Anyone who's ever moved out of an apartment knows there's a special, poignant look to the empty space they leave behind. A Minneapolis photographer has captured that moment in a new show called "Apartment for Rent." Minneapolis, Minn. — A couple years ago, when he was a grad student studying photography at the University of Minnesota, Anthony Marchetti had an artistic crisis. He hated his work, partly because there was no point to it. "And I was kind of floundering," he says. "I didn't know what I wanted to actually photograph and how I wanted to make my art, or of what." During the day, Marchetti is what's called a 'turn painter,' someone who gives apartment interiors a fresh coat of white before the next tenant moves in. 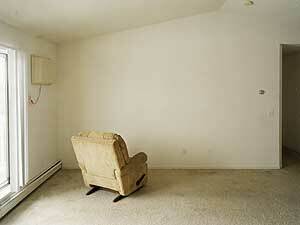 Most of the apartments he paints are in the first and second ring suburbs of the Twin Cities. Some friends suggested he consider the spaces as subjects for his photographs. Initially, Marchetti resisted the idea. "But after a while I started becoming very intrigued by what people were leaving, and how these spaces felt with this almost emptiness, this stillness in them but still just a trace of presence," he says. Marchetti has also painted luxury condos in the city, as well as "Section 8" low income housing. From his standpoint neither are as aesthetically appealing as suburban apartment complexes in terms of capturing what he calls "the in-between moment." Marchetti says when renters of high-end apartments move on, they take everything with them, while low income tenants tend to leave a lot of clutter behind. He's found that when many suburban renters vacate a space, some small artifact of their existence remains. "And it seems to work out for the photographs because there's this overwelming whiteness involved, and this neutrality with the beige carpet and the white walls, and the white trim and the white doors," he says. "But then there's just these little things that poke out as details, that become the subject of the photographs." Marchetti's photographs are large, 3 1/2 by 4 1/2 feet. That's big enough to make the viewer feel like they could walk right into the space. While every picture documents the architectural uniformity of suburban apartment living, the mock-cathedral walls, the electric radiators along the floors, the ocean of whiteness, they also contain some thing that disrupts the monotony. In one photograph there's a lone calendar featuring scantily clad women. In another, a woman has used an entire wall to scrawl a hateful jealous warning to another woman. Marchetti's favorite photo shows a rectangular front window with a row of broken blinds dangling beneath it. For him, the view through the window is revealing. "You can that's there's just buildings that go off into the distance," he says. "I think there's only three or four that you can actually see but it gives that feeling that they could go on forever." Marchetti insists he's not trying to make some statement about the suburbs with his photographs. He considers himself an archivist of a certain transitional moment that happens quite frequently among suburban apartment dwellers. Some say the pictures have a depressing, almost ghostlike quality. Others, such as Kerry Morgan, see something different. Morgan is Coordinator of the Gage Family Art Gallery at Augsburg College, where the pictures hang. She says there's a quiet beauty to their clean lines and austerity. She says it's partly because of their sheer size. "You enter in and kind of lose yourself in these very boring, plain spaces that somehow become very evocative, and lovely," she says. Morgan says she used to live in apartments like this when she went to school. She says every society has some kind of mass housing for people who don't yet have permanent roots. "I don't see that as a negative," Morgan says. "It's a necessity. And on some level there's something quite calming and welcoming about these spaces, like these spaces are going to be renewed and allow for new lives to come in and fill the spaces." "Apartment for Rent" runs through July 15th. Anthony Marchetti says if nothing else, the prospect of taking pictures at these apartments has turned his job as as "turn painter," a job he used to dread, into a treasure hunt.